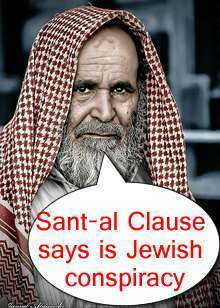 IS Santa Clause an illegal immigrant with no right to work in the UK? And what of his elves? News reaches Anorak of four stowaways discovered in the back of a lorry carrying an artificial Christmas tree to Northampton. The 32ft aluminium and nylon tree was to be erected in the town centre. Two elves from Iraq and two from Iran have been arrested and handed to the UK Border Agency for safe keeping. “The lorry had parked up at the depot and when the back was opened, some people got out who were not supposed to be there. Can the elves get through the security cauldron? Will we get our presents and our treats and our Christmas hampers? Anorak learns that a group of Iraqi elves have been caught trying to enter Britain by hiding inside a lorry filled with ham.